The LMN Spring meeting will be on April 26th and will be a special meeting on Separation Science. 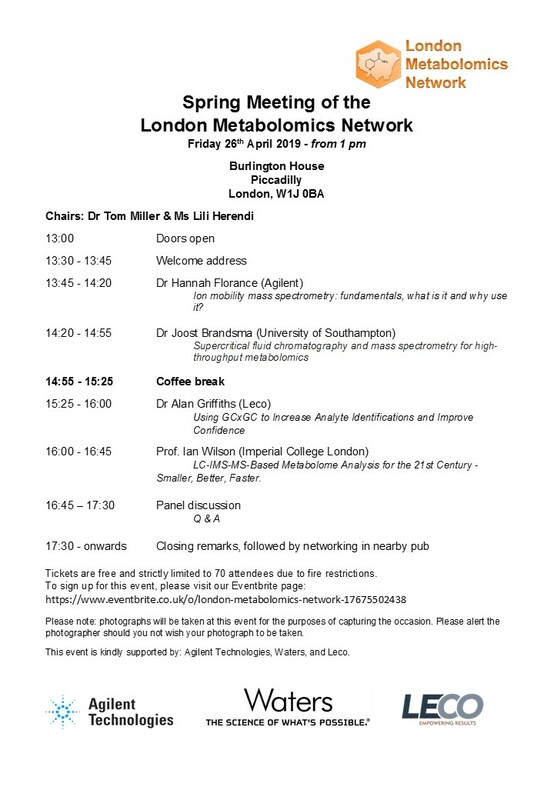 The event – starting at 1 pm at Burlington House – will showcase some techniques that are perhaps not the most commonly used and yet can easily be exploited in the metabolomics world to improve our results, most notably our identifications and quantifications. Together with our keynote speaker – Prof. Ian Wilson from Imperial College London – specialists in the techniques of ion mobility (Dr Hannah Florance, Agilent), supercritical fluid chromatography (Dr Joost Brandsma, University of Southampton), and GCxGC (Dr Alan Griffiths, Leco) will give talks on the science behind these techniques and how they may be used in the modern metabolomics world. This meeting is kindly sponsored by Agilent Technologies, Waters, and Leco.